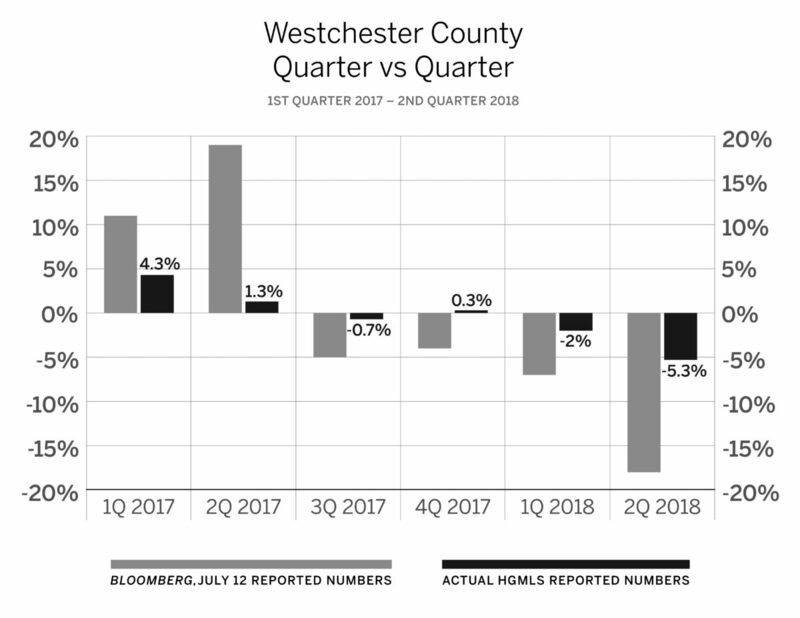 In our recent rebuttal to the Westchester County real estate stories that have run in Bloomberg, The Wall Street Journal and other news outlets, we set out to correct the record on exactly how the market performed during the second quarter of 2018: unit sales declined by 5%, according to the Hudson Gateway Multiple Listing Service (HGMLS), not the 18% claimed in the articles. We encourage you to read our response to the news stories on our website, williampitt.com/blog. In the days since we posted this analysis, we have been asked to address another key piece of data mentioned in the stories: that the second quarter was the fourth consecutive quarter of year over year quarterly sales declines. Again, we have found in our own research that this assertion is overstated. According to the HGMLS, the first two quarters of this year saw declines of 2% and 5.3%, respectively—significantly lower than the decreases identified in the quarterly Elliman Report, which served as the source for the news articles and itself is sourced by the HGMLS. The fourth quarter of 2017 actually shows a small increase of 0.3%, and the third quarter of 2017 a slight decrease of 0.7%. Therefore, it is not true that there have been four consecutive quarters of declines, and where declines did occur, they were not nearly as steep as reported. The data does not seem to illustrate a year-long trend of falling sales. The Elliman Report supplied grossly inaccurate numbers, as you can see from the charts below illustrating the actual data as well as theirs. We’d also like to bring in yet another data point to consider. The Bloomberg article from August 1 states that the $1.5 to $3 million price range in the Westchester housing market has been the hardest hit. We would argue this claim is not entirely accurate, and that more context is needed. It was actually the $1.5 to $2 million range—not $3 million—that struggled in the second quarter. We should not diminish the importance of this fact as this segment makes up a large chunk of the high end market, but as we look higher up the price ladder, we see that the upper end is holding its own. Sales from $2 to $3 million were ahead compared to the second quarter last year, and the upper end $3 million-plus market was only minimally off, as you can see in the charts below highlighting how different price ranges performed. Even more intriguing is that following the close of the second quarter, that challenged $1.5 to $2 million price range exhibited signs of recovery in the month of July. As shown in the July charts below, sales were close to flat for the month versus July last year, which was a major improvement from the second quarter. The $2 to $3 million and $3 million-plus ranges, meanwhile, both jumped ahead in July compared to the same time last year. The economic indicators we referenced in our original rebuttal—consumer confidence, interest rates, the stock market, unemployment, GDP—all still stand near historic highs or lows, which traditionally points to health in the real estate market. We believe these macro U.S. data points apply to our local housing markets just as they do nationally. As we have demonstrated, sales are pacing closer to last year than the media has reported. 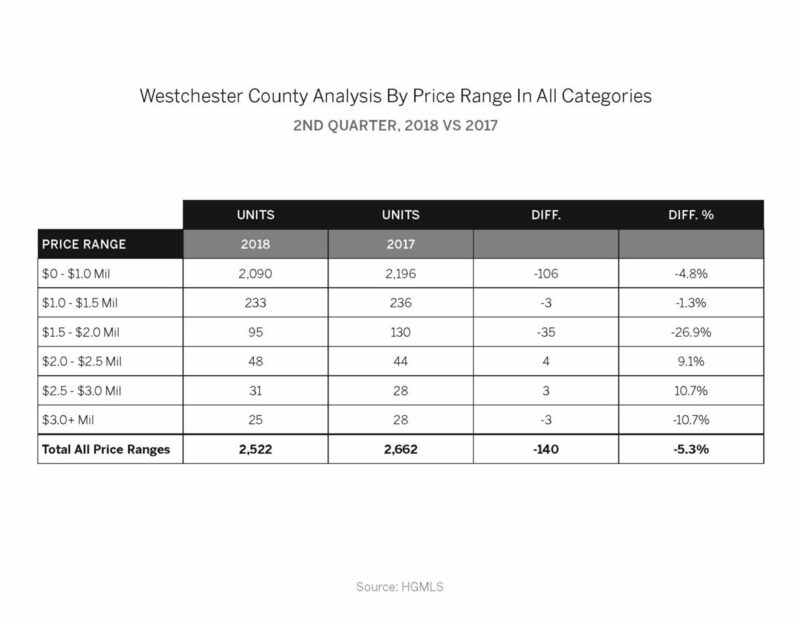 In light of these ongoing stories from major media outlets supporting an exaggerated negative narrative on the Westchester real estate market, we will continue to closely monitor how the market is performing. Going forward, we will post a report on a monthly basis in our continuing effort to ensure consumers are armed with the facts when making real estate decisions. I invite you to contact me if you have any questions.